Learn more about the innovative products available from Equi Cool Down. Whether you are looking for wraps for your equine athlete, headbands to keep you cool while on trail, or more information on the use and care of Equi Cool Down products, you will find the additional information below. Equestrians know, when we ask our horse for their best performance, they usually work up quite a sweat in the process. Whether you’re out trail riding, performing at your best in the show ring, or simply working in a training arena, your horse’s body temperature will rise as exertion levels increase. 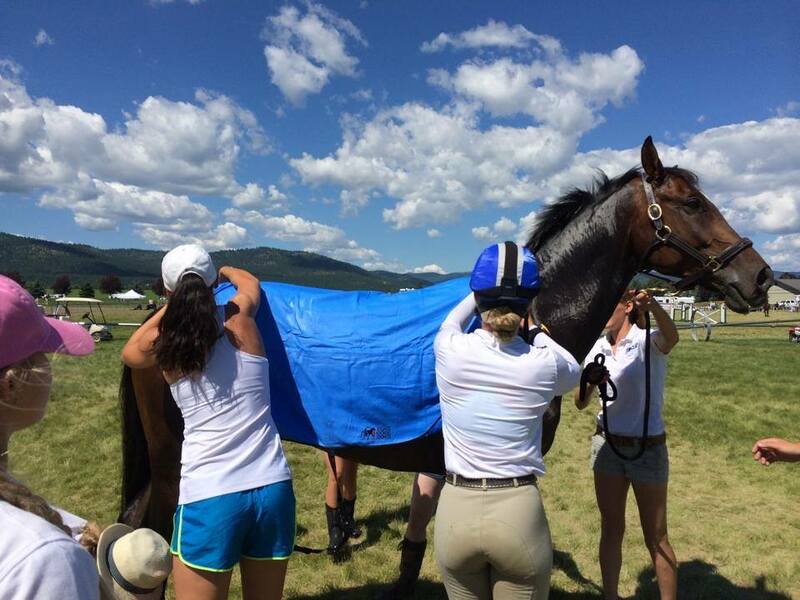 Just like with human athletes, allowing the horse’s body time to cool down is crucial. Heat hurts, and getting rid of this heat will keep your horse happy and healthy. With Equi Cool Down, it’s never been easier to help cool your horse down. Equi Cool Down textile technology uses an advanced hyper-evaporative material, which when activated will drop up to 22° colder than the outside temperature. Cool your horse down, minimize heat and inflammation, or ease post-injection swelling relief with Equi Cool Down’s state of the art range of body wraps, leg wraps, and neck wraps. The versatile “one-size-fits-most” design uses adjustable and flexible chest and leg straps. These allow your horse comfortable movement without the fear of the wraps falling off. Simply spray the wraps down with water, wave it through the air to activate the air flow and the cooling process. If your horse is already wearing them, wet the wraps with water and walk your horse around to reactive the cooling mechanism. Equi Cool Down wraps do not require refrigeration. The reusable wraps can also be hand washed or machine washed. Cool downs have never been so easy! When you’re out in the heat all day, cooling down becomes an absolute necessity. Ask anyone who has suffered from heatstroke in the past and they will tell you one thing: It is a miserable experience. Keeping yourself cool isn’t just about drinking enough water. While staying hydrated is absolutely paramount, finding respite from the heat in shaded areas or by cooling your body from the exterior is as important as good hydration. Your body’s natural process to keep you cool is to sweat. With Equi Cool Down products for riders, you can aid your body in cooling down using the same innovative patent-pending technology that your equine partner can benefit from too! Cool down, minimize heat and find welcome relief with Equi Cool Down’s state of the art range of head bands, towels and beanies. You can even take them out on trail or to competitions with you, providing you cooling relief anywhere! Equi Cool Down products require no refrigeration. Beating the heat has never been so easy! Rinse before and after each use. Saturate product with any temperature water from any source (tap, pool, fountain, bottle, river, etc.) before use and squeeze out excess water. Please note that due to their size, body wraps get very heavy and unwieldy to squeeze. Try the mist setting of your hose to reduce the amount of excess water you need to remove. Shake or wave the product to activate & place on heated body area. Simply wave every 20-30 minutes to keep it cool. If the product is drying out or totally dry, simply dip into any water source and shake or wave again. Machine or hand wash separately with mild soap or detergent. DO NOT put into the dryer. When not in use, fold while moist & place in any ziplock bag. An Anti-Microbial bath helps prevent mold or mildew accumulating on the damp product. For more instruction on Care and Use of Equine products – please take a moment to view our videos, below. We have versions of our brochure in German, French, and Spanish. Simply download the PDF file below in the language of your choice.